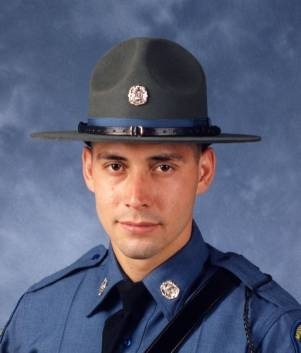 Trooper Newton was killed when his patrol car, a 2003 Ford Crown Victoria, was struck from behind while he was making a traffic stop on the shoulder of I-70 near Odessa, Missouri at 7 a.m. The patrol car burst into flames upon impact and Trooper Newton was trapped inside. The driver of the vehicle he had stopped and the driver of the truck that struck his patrol car were both injured in the accident. Trooper Newton was assigned to Troop A in Lee's Summit and had been with the Missouri State Highway Patrol for over two years. He is survived by his wife and two young sons. May Gods embrace make you whole and bring peace until your family is one day re-united in perfect joy. My wife was an EMT called to the accident. It is still with her these many years later. You are still in the hearts and minds of so many. Hero.